Increasing concern about data security the past few years has brought fresh opportunities in the market for functional apps that don’t encroach on user privacy. MapitOut is exactly that: a full feature maps app and travel planner that does what it says it does, without making your movements available to faceless network marketers wanting to sell you viagra. You can use Mapitout to find pretty much anything you could need for a trip away, even if it’s just out your front door – cafes, casinos, even parking lots or wave heights at the beach. Do it either on the fly, or before you head out by saving points of interest to a map you can use later. From the home screen hitting ‘search’ takes you to the control panel, the Mapitout map, where you have access to about 30 different features. 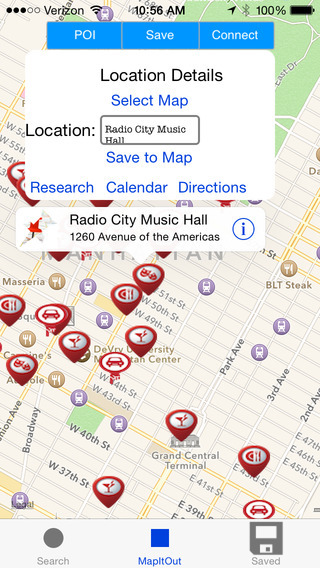 On all nearby locations there’s the option of learning more, saving to a map you’ve created or adding to a calendar. 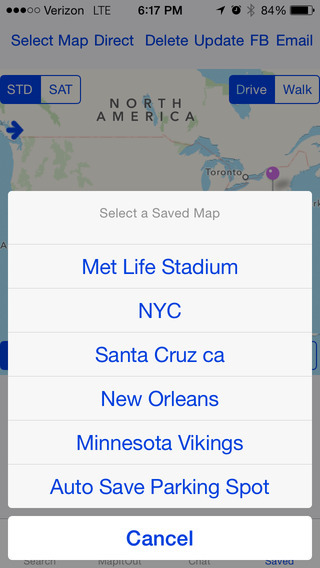 The map save is surprisingly useful, so we recommend giving it a try next time you’re planning a day trip. For the best experience also make use of the bonuses in the ‘save’menu, like travel time, live directions and local weather updates. A drawback of MapitOut is many of these extra features are’s all that intuitive: in some cases I needed to fumble back and forth just to see how they work. Navigation around the app can be difficult and and some tools don’t appear to work as intended. 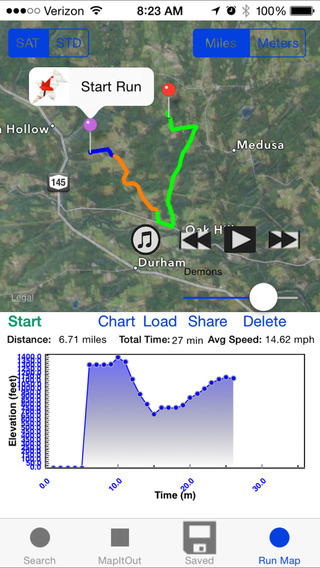 The interface is explained in detail on the Mapitout website, but as apps are generally intended to save time, sitting down for an afternoon to read about one is a path too far for most. Having said that, it’s nice to know your data’s secure.Many tools use third party sites for assistance (Yelp for cafes, for example), so you are still using online tools, but it’s kind of required to get what you need. Nearby features are quick, surprisingly easy to use, and most importantly, accurate. And some features, like the running tracker, won’t download a thing. MapitOut offers plenty of location tools without compromising your security, and that alone makes it a useful download. If you’re happy to check the website and read how to use the little things it will make your experience much more enjoyable. Future updates will improve functionality but right now it offers a good all-in-one alternative to the map giants. A bargain at $1.99, especially if you travel frequently.